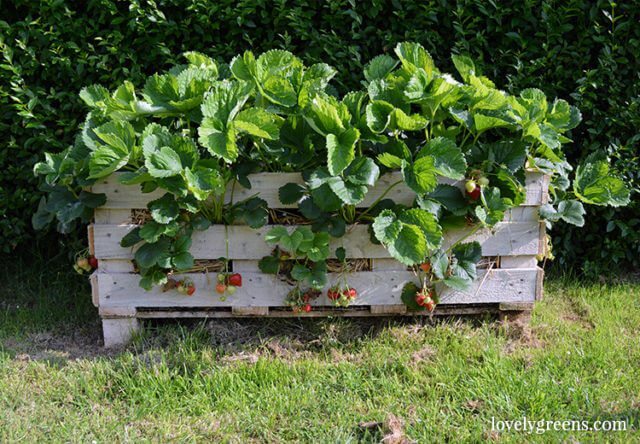 Instructions on how to plant a handmade Strawberry Pallet Planter with up to 20 plants. Includes a link to how to build one and a planting-up video at the end. 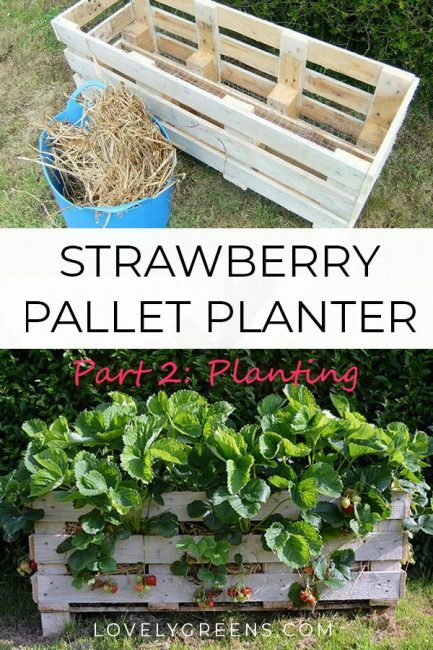 Three years ago I shared how to make a Better Strawberry Pallet Planter and currently have two of them in my own garden. They grow loads of berries in a relatively small space so I’ve had a lot of people interested in the project. This piece goes through how to plant one up with up to twenty strawberry plants. I grow strawberries in both the garden and at home and get as much productivity out of the plants in the pallet planter as I do in the open ground. The trick to keeping your plants happy is to plant them in rich compost and composted manure and to keep the planter well watered. Once you’ve planted it up, the plants inside will last from two to three years and will only need a top dressing of more composted manure each spring. 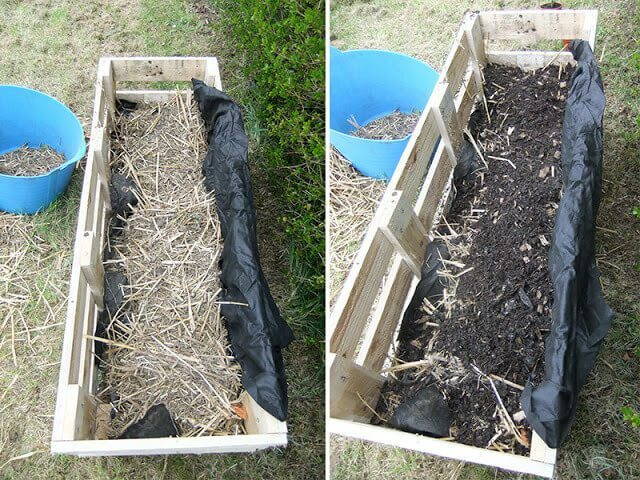 Keep the top of the planter and the gaps between the slats filled with straw to reduce water evaporation and to keep the compost in the planter. 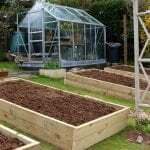 Your four main materials needed for planting are straw, multi-purpose compost and/or composted manure, and landscaping fabric. The latter is to keep the compost from falling out through the gaps on the back, bottom, and sides of your planter. You’ll also need plants. Any strawberry plants will do and I’ve planted my original planter up with some generic variety from the local gardening centre. My planters have 18 plants each but if you plant the sides up you can have 20 plants growing. Theoretically you could plant the back side up as well. I imagine you’ll need to feed and water the plants even more to get a harvest if you do so. Even with the straw mulch you’ll still need to water your planter every day. All planters need daily watering but to get juicy berries and keep your plants thriving, make sure you don’t forget, especially in the heat of summer just before they fruit. To see the entire process, watch the video at the bottom and subscribe to my YouTube channel as well. Inside the Strawberry Pallet Planter will be wire mesh / chicken wire that you’ve lined the bottom with. Mine is not attached in any way to the wood — it’s just pressed in. This wire will keep the compost and straw from falling through. Next, line the bottom and back with landscaping fabric. This will also help keep the compost in and also doesn’t need to be attached in any way. 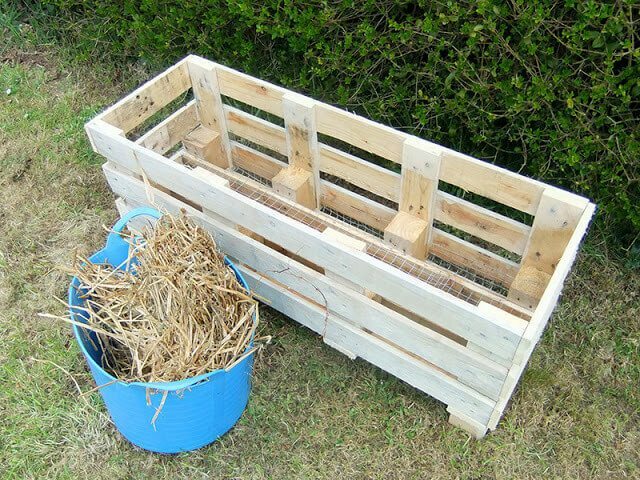 Put a layer of straw in then fill the planter to the first set of slats. Place your strawberry plants in from from the inside and pad out the empty space in the gap with more straw. When all your plants are in for that level, add more compost to bring the level up to the next set of slats. Repeat. 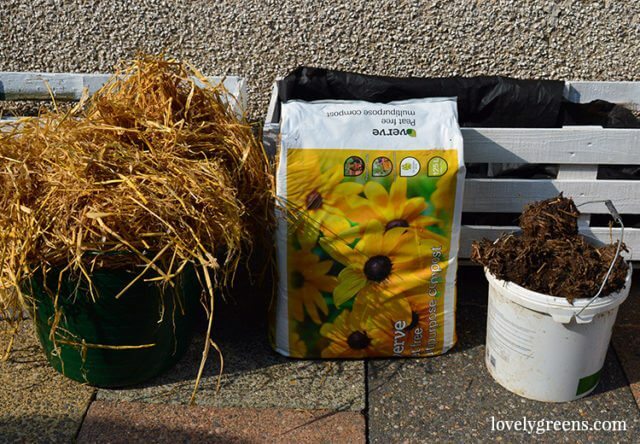 I recommend that you top dress the surface of the planter with grit or more straw. It helps keep moisture in the planter and also reduces any soil erosion when you water it. Even so, soil will come out of the planter over time and it will accumulate underneath. Clean that area regularly or use trays to catch the run-off. This planter will need daily watering in the middle of summer. 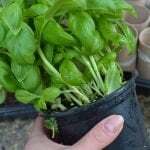 At other times it will stay moist for longer periods — use your finger to determine if the compost is moist or not. 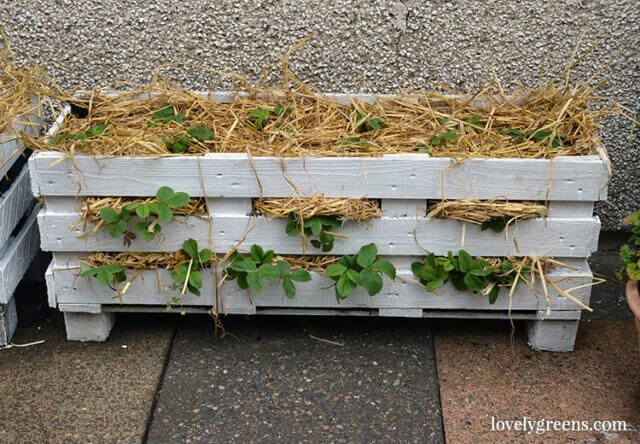 As for longevity — my first strawberry pallet planter lasted five years. It was looking a bit rickety towards the end but probably could have kept going if we didn’t have to move house. You’ll also need to replant this planter after its third year. Strawberry plants need changing out after that time and it’s also a good opportunity to repaint it if you’d like. I’d suggest an eco-friendly paint option if possible. If you have any further questions on how to plant the Strawberry Pallet Planter please leave me a comment below. Watch the video below to see how I plant mine up and head over here if you’d like to see how to build your own. I’m so disappointed, the plants did not grow out the sides, The plants on the top did wonderfully but the sides died, I even bought more plants and planted them in the sides again and they also died. What am I doing wrong? Hi Tanya, can you let me know how to line the planter . Thank you. Watch the video at the top of the post for more info on lining the planter. I love this idea and can’t wait to try it. Hopefully my pallet at home is the right kind! One suggestion… I think it would be nice to add casters to the bottom so you can roll it around the patio. Thanks for the tutorials, I made a planter following your instructions yesterday, so far so good. In regards to planting when you say multipurpose compost, will compost from my compost bin be ok? Or are you referring to multi purpose potting mix compost? If I do use regular compost can you advise any amendments to make it suitable for the planter? I have been told compost in containers is too heavy. Compost from your bin is ideal! If you’re planting strawberries make sure to give them rich material to grow in and/or feed them regularly. I’ve had my strawberries growing in composted manure and garden compost for years now. I change it out every 2-3 years. 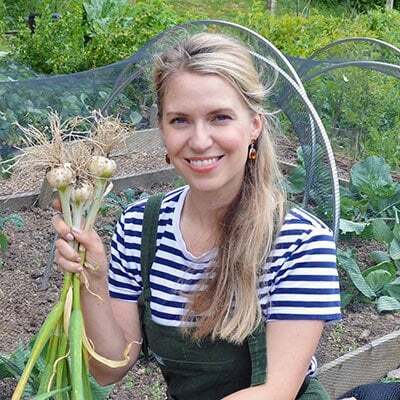 Dear Tanya, please explain what is the WELL COMPOSTED MANURE. Can I just go to a stable and get some that is a few days old? Thank you. BTW i will send you pics of my project. Fresh manure can harm growing plants — the urea burns them. When using manure around growing plants, make sure that it’s sat in a heap for at least six months. Some gardeners will apply fresh manure to the soil in winter but I’ve not tried that myself. Thank you. I guess I have to try some other organic fertilizer.